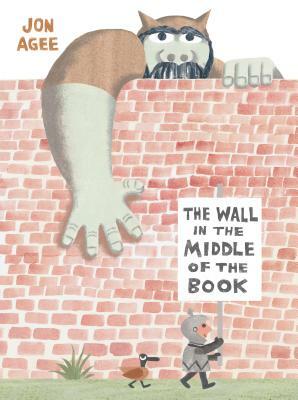 There's a wall in the middle of the book, and our hero--a young knight--is sure that the wall protects his side of the book from the dangers of the other side--like an angry tiger and giant rhino, and worst of all, an ogre who would gobble him up in a second! But our knight doesn't seem to notice the crocodile and growing sea of water that are emerging on his side. When he's almost over his head and calling for help, who will come to his rescue? An individual who isn't as dangerous as the knight thought--from a side of the book that might just have some positive things to offer after all! Jon Agee is the author/illustrator of many acclaimed books for children, including the Boston Globe-Horn Book Honor winner It's Only Stanley and the ALA Notable Books Little Santa, Terrific, Milo's Hat Trick, and The Incredible Painting of Felix Clousseau, and a series of popular wordplay books including the IRA-CBC Children's Choice book of palindromes, Go Hang a Salami! I'm a Lasagna Hog! Jon grew up along the Hudson River in Nyack, New York, and went to college at The Cooper Union School of Art in New York City, where he studied painting and filmmaking. Now a full-time author, he lives in San Francisco with his wife, Audrey.